There are so many opinions and objectives to this 2018 tire rule change. The, "Big Topic" on the AdHoc board was reduction in cost, and where are most competitors spending their money to race. Where could operating cost be reduced? Tires? Fuel? Brakes? Body Damage? Transmissions? Entry fees? Travel cost? One of the discussions to "reduce" the cost, was by tires by either a spec tire, a tire-marking system, and/or a "harder compound" tire. The compromise and blending of rules and tire rule change is similar, but not identical to TA3/4. TA3 cars, when on Hoosiers, could ONLY run R7, and would be allowed 5 total tires for each specific event. Tires were marked and the tires a competitior qualifies on, is what they must race the entire event on. Formula Mazda has this tire rule. This specific TA3 tire rule is NOT our AS tire rule, just showing one of the many paths that led to this idea. My opinion would NOT be to implement a rule change mid-season, rather the start of a season, 2018, 2019, whatever makes the most sense. This will take more effort for the change for all. Not certain how many AS racers have a "Good" stockpile of A7's that are "Good" for 2018, along with the argument that this is the reason why we are implementing rule mid-season. I know every tire I have sitting around isn't "Good enough" for my first race of the 2018 season. Seems there are some assumptions happening here which need to be addressed. This tire rule was agitated for for almost 2 years, by competitors NOT on the ad hoc. When the rule was proposed, it was put out for comment in MAY. Now, 6 months later, people are complaining? This was never proposed in it's current written form as a new tire rule! It was part of a WDYT--mentioning multiple options which is very different from a rule proposal! People have not been in favor of this since it was first mentioned--and those same people are again voicing their dissatisfaction! I get Matt, he opposed it from the start, but some of you need to pay attention to the rules on years when the runoffs are not in your back yard. Very inaccurate Scott! I wrote one of the first letters against this rule, along with Matt and others. I own 2 A Sedan cars and Aaron is my son and driver of one of them. So why was this brought up now and not for 2019 like the engine rule being considered and put out as a WDYT at the same time !! The theory here is cost containment. There will always be drivers that qual on new rubber every weekend. However, Used A's for the "I cannot afford new rubber every weekend" people, which is most of the class, fall much further off of "new" performance than do used "R's". If cost containment was the goal why not ban the Hoosier A7? It is the most non-cost effective tire available for A Sedan cars!! In theory, everyone on R's tightens the field. Maybe it is more perception than reality, but perception is real. R's should also give you more usable heat cycles. In Theory rev limiters, equal weights, equal tire sizes, equal brakes would tighten the field too! Perception is perception, nothing more. Scott--you seem to forget this is NOT just about Hoosier tires! 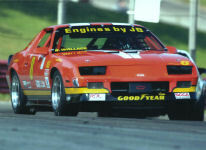 Other companies have spent millions to develop tires very suitable for SCCA racing. They are not anywhere near as disposable as a Hoosier A7, and many are just as cost effective or even more so than the R7. Since when is what is done in Pro racing applicable to club racing? Also isn't there a spec tire in Pro Racing? On what board?--are they actually buying these A7's? Seems to me all this is saying is that the Hoosier A7 shouldn't be used on a Road Racing car! A Sedan is not and never will be a "Spec" class. One can build two A Sedan cars for what many of the Spec Miata guys have invested in 1 car. Spec Miata has big fields because there is somebody to race with--regardless how competitive. A Sedan rules over the past 10 years have sunk that boat for A Sedan. How many regional local A Sedan racers go out and buy new tires--very few! I believe many buy used tires from National or majors guys that have a heat cycle on them and run them to the cords. That won't happen any more--no more one heat cycle tires on the market--so now those guys have to go buy new tires. This rule is really about removing Choice --And if it isn't I challenge Andy, or Wheeler or Danny or any others to run next year's runoffs on a BFG R1, or Hankook Tires. Pro racing, its rules, environment, do trick down, or even work its way from club to pro. Fuel sample ports, BOP, restrictors, Spec Miata to Pro MX5, etc. We as club racers can learn fro pro racing, both in positive and negative. Pro racing utilizes a, "One make, one compound, limited number of tires per weekend approach" for certain series. One of the reasons is cost control. Yes, cost control. Example, in October the Laguna SRO 8 hr GT3 pro race capped ALL PRO teams to 10 sets, for the entire practice, qual and 8 hour race. solely to reduce operating cost. Why not at least look at all avenues? If AS would be go to a "Spec Tire", wouldn't that eliminate ALL CHOICES? AS will NEVER be Spec Miata, its a completely different animal, as I know from 5 years in SM. The reason I continue to bring SM into the AS discussions is how attractive it is to the masses, and how we need to make AS more attractive to the club. Why not explore the heavily-populated classes, learn what makes that classes attractive and maybe bring a percentage to AS to grow AS? Matt-For the most part I agree with you. No offense was ever intended. Just because individuals aren't in favor of a change doesn't mean they are being negative or not looking forward. If I weren't interested in the forward progress of this class I wouldn't be here. Just because a rule change is proposed doesn't automatically mean it is good, or it is necessary, or it is going to help the class. My belief is that this rule will hurt the class, so I am voicing my opinion as others are doing. SCCA Pro Racing has it's own set of issues, good and bad and I just don't want have that cloud the issue. I agree--spec tires remove all choice--This rule is a back door step into a spec tire. I also want to grow A Sedan and show it to be a more fun, less expensive alternative to a class like Spec Miata. This won't happen with tire rules that will ultimately require new tires every session--all this rule does is slow down the class as a whole---no new track records, less grip, slower lap times. New R7's every session instead of new A7's. False Economy for some and just plain slower for others. IMO the new tire rule has made the most expensive tire (Hoosier R7) the de facto class spec tire. If we had received some help from Hoosier in the way of a tire discount and or better contingency program to go along with the spec tire designation then the new rule would make more sense. I tried 4 different tire brands in the past few years and used both the "hard and soft" compounds for each. The only truly autocross tire was the Hoosier A7 and it would wear out 2-3 times faster than the other Brands soft tires. Did anyone consider just outlawing the A7? If cost saving is the goal, this makes the most sense to me. The best 2 tire Company match up would be the R7 against the BFG R1S IMO. From my own experience the lap times would be very close with a slight edge to the R7, tire wear is about the same, and the BFG's get the nod on cost, but not by much. Thanks so much in the past for all your efforts with this rule. Catching my errors on the tire list and offering insights into additional tires to add to the list that we missed was very helpful. Since you sent in two letters on the subject (21900 and 22123), you are welcome to share your thoughts here from both letters, if you choose. Finally, to everyone. You are certainly welcome to discuss anything you wish here, but, I'd like to remind all of you of a couple of things. This idea went out as a WDYT in the May 2017 Fastrack, and was turned into a REC in the August Fastrack. The BOD saw it in their November meeting and requesting a procedural timing change so that competitors had more time, based on their own schedules, to use up soft compound tires. That change was made. So, basically, everyone has had from May to October to correct our tire list, add to it, submit letters in favor or against this change. 6 months is a typical time frame for this process. For years I have encouraged everyone to watch here for my notices and read Fastrack on a monthly basis. For years i have asked everyone to write letters, as anything you post here is not official. Once again I will encourage that. This is your class. As I said at the Runoffs, if we make this change and people don't like it, we can write another rule sometime in the future to change it back. If we get a groundswell of letters indicating that, we can make it happen. But, if you look at the history of our class and the typical number of letters we get in a WDYT, it is very small compared to other classes. Sometimes a class will send in 50 or more letters about one WDYT. Think about some of the things Matt Jensen wrote. He talked about reducing costs at the track. If harder compound tires will last longer in decent "lap time" shape, that gives a chance to those that have not had it before, those that can't afford multiple tires sets per weekend, or, even a new set every session. That was the premise of this idea, for the good of the class. But, if you want to go back to any DOT tire as long as it meets the size requirements, we can. Final word. The more letters we receive, the more we will know the directions the community is interested in. i wrote a letter in opposition also. For those who may not have caught it--The tire rule has not been passed by the BoD per the December Fastrack. bod@scca.com and voice your opinion. As we all know, of all the tires available for A Sedan only the BFG and the Hoosier have really shown to be competitive. The new rule will, in effect, make A Sedan a 1 tire class because the BFG R1 tire was discontinued in the A Sedan sizes as long as 2 years ago, (due to lack of sales because racers were purchasing the R1S) The other tires mentioned in the new rule are either not available in the max A Sedan Sizes or have to be shaved to get any performance, and with that still are no where close to what the top 2 tires have been in performance. Over our 10+ years in A Sedan we have used, tested, and raced on 5 different brands of tires and 7+ different compounds. We have used Good-Year,Toyo, Hankook, Hoosier, BFG. We found the BFG R1S to be fast,consistent,durable---That tire and others will not be a choice any longer. I may be wrong but it appears this campaign of letters to the BOD was an effective route of communication concerning this matter on tires? What changed their mind on this situation?